I’m really bad at saying no. Like really bad. And now that I’m hard at work creating a new identity as a not-designer, I very much need to learn how to be better at it. The thing is, I like helping people, I like being busy, and I really like for people to like me, so I tend to say yes whenever someone asks me to do something for them. But here’s what happens way too often: I say yes to something I don’t actually want to do, and then something I do want to do comes along and I’m too busy to do it. Now all the good feelings are gone. I’m pissed that I said yes to the first thing, and I’m frustrated by not having the space to do the thing I want to do. Repeat cycle. 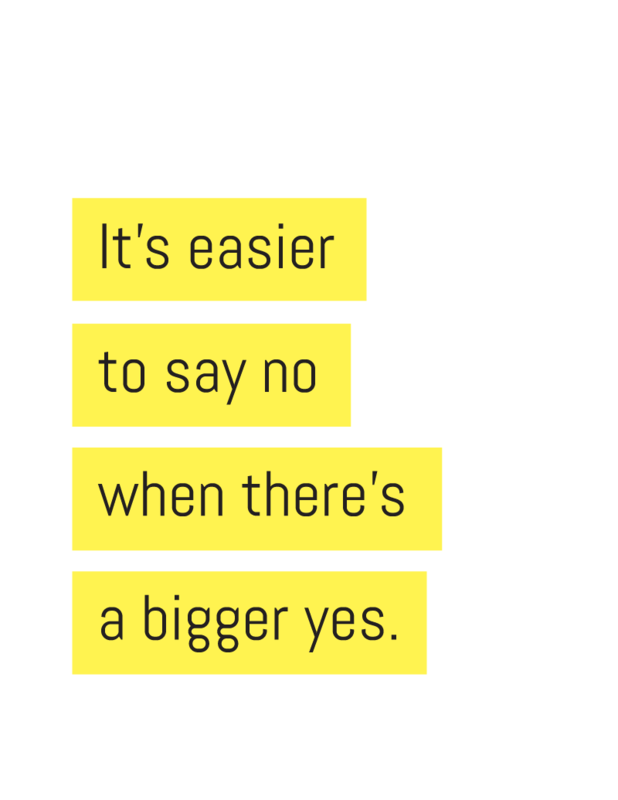 It’s easier to say no when there’s a bigger yes. So I decided to design a little card to help me remember.